WSCC is a portable program that allows you to install, update, execute and organize the utilities from various system utility suites. The included Update Manager can check for newer versions of the utilities already installed and can download and install the missing items. Alternatively, WSCC can use the http protocol to download and run the programs. WSCC is free for personal use. Version 2.5.1.0 which I'm still using, is great but it seems to miss updates of a few Nirsoft utilities, as well as some newer published utilities. Maybe the author isn't updating the older freeware version any more? This brilliant program deserves at least a full size preview picture! Been using this for a few months now and it really is a great front end for these two titans of computer utilities. Very nice. Incredible. With this toolkit you do not need anything else for diagnosing an issue on your PC. Nirsoft + Sysintenals is a dangerously powerful combination. would rate 10000 stars if I could. This is a GODSEND if you use nirsoft and/or sysutilities. What a beautiful, portable, easy way to update these software. I owe the developer my sincerest gratitude! Extremely useful organizer for many powerful technician utilities. One may put WSCC in a specific folder, define the location of the files to be on a subfolder, and take it on a portable drive/Dok to use it on other computers as well. Makes the management and use of Nirsoft's and Sysinternal's utilities much simpler and faster. It seems that WSCC is no longer suporting Win98SE! The nirsoft version of this allows you to create a third grouping which you can put other vendor's applications in. You are not restricted to just these two. It's some how a pity that this one misses out on that. 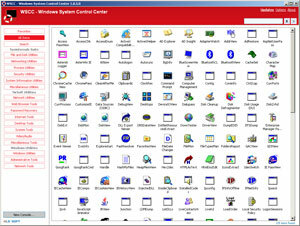 Welcome to 20 years ago windows users. This is hands down a must have utility. Having, at your fingertips, access to all NirSoft *AND* Sysinternals utilities? And a Portable Apps version to boot? Now even including Windows' native utilities, too? Wow. Simply - Wow. The update mechanism is nera flawless, and it makes life a lot easier. Being able to find the utility you want, to be able to use it as you want, and the only thing I can think of that would make it perfect would be to allow the user the ability to run each app with elevated privileges on demand. Still, this is such a minor thing (and would need to be tailored to allow for credentials on systems with restricted users) that it may not be the easiest thing in the worlf to implement, and thus is hardly worht any sort fo demerit. Checks for updates, downloads what you don't have/want, but you have full control of this. Gives a description of each app as well as its proper name. To top it off you can open each program from within WSCC! Very awesome. This will allow you to download and install ALL of the utilities supported by Sysinternals and Nirsoft, even newly added ones! It is also a very convenient way of launching these utilities, a very nice front-end.